Hip pain is a common condition and can be quite disabling because of the impact on walking. Pain may be localised to the front, side or back of the hip joint. Common cause for anterior hip pain is joint problems such as arthritis, that on the outer side of hip is greater trochanteric pain syndrome whereas posterior hip pain may arise from multiple sources such as sacroiliac joint, lumbar spine, piriformis muscle etc. It is important to evaluate lumbar spine as spine pathology commonly coexists and can be responsible for producing/ exacerbating hip pain. Hip joint is one of the common joints to be affected by osteoarthritis (OA). Patients often complain of groin pain which worsens on weight bearing. As this joint has a significant role in mobilisation, pain and reduced range of hip movement can adversely affect daily activities, quality of life. Simple activities such as wearing shoes and socks can become a challenge. Conservative treatment of hip osteoarthritis includes weight management, painkillers, activity modification and physical therapy. Injections can be used for diagnostic and therapeutic purposes. Diagnostic injections can help in differentiating hip pain from pain originating from other sources. Hip joint injection can be performed under x-ray or ultrasound guidance as a day case or outpatient procedure. A mixture of local anaesthetics and steroids is injected. Trochanteric bursitis presents as pain on the outer side of the hip. It has been renamed as Greater Trochanteric Pain Syndrome (GTPS) as it represents a number of conditions, including muscle tears, tendon problems, bursitis and trigger points, with similar presentation. On the outer side of is present the greater trochanter (bony edge on the top of the thigh bone where the buttock muscles attach) and many bursae to prevent friction. GTPS is more common in middle aged or elderly women and in athletes involved in prolonged running. Trauma, repetitive stress, leg length discrepancies and weak hip muscles are predisposing factors. It presents as pain on the outer side of hip which can radiate towards the knee. Lying on the affected side may be uncomfortable. Conservative management involves avoidance of aggravating activities, ice, weight management, painkillers and physiotherapy. I offer injections if the conservative management is not producing desired results. Local anaesthetic and steroid injection can help break the pain cycle and facilitate physical therapy. The injection is performed under ultrasound guidance to ensure delivery of medication at the correct site. The iliopsoas is made up of two separate muscles: the iliacus and the psoas. These span from the spine and pelvis to the upper part of the thigh bone and play an important role in maintaining upright posture, lifting the leg. Iliopsoas tendinitis or bursitis presents with hip or groin pain which can radiate towards the thigh. It tends to be worse with activities involving flexion of hip such as while walking, climbing stairs and wearing shoes. 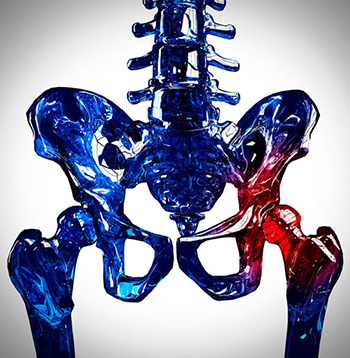 Injuries, overuse, previous hip replacement can predispose to development of this condition. In some cases an audible clicking/ snapping sound originating can be heard. Injections are considered if the conservative therapy fails to achieve the desired goals. The procedure involves injecting a mixture of local anaesthetics and steroid under ultrasound guidance. Branches of the femoral and obturator nerves supply the hip joint. This procedure is aimed at interrupting the transmission of pain signals from the hip joint. This procedure offers an alternative for patients who are not keen or are unfit for hip replacement surgery. This can also be offered to patients with persisting pain after hip joint replacement. This minimally invasive procedure is performed as a day case under local anaesthesia and does not involve any surgical incisions. 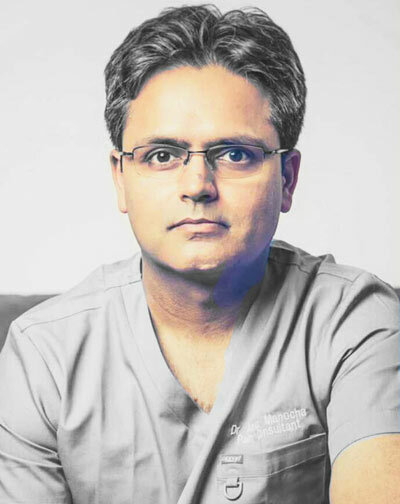 Initially diagnostic blocks are performed using a small amount of local anaesthetic under x-ray and ultrasound guidance followed by the radiofrequency treatment if indicated. Lateral cutaneous nerve of thigh supplies sensation to the front and side of the thigh. Injury, compression or entrapment of the nerve can lead to numbness, altered sensation and pain in the area innervated by the nerve. Recent weight gain or loss, tight belts and clothes are predisposing factors. Common site of compression of the nerve is as it enters the thigh travelling in close relation to one of the thigh ligaments. The nerve can be identified with the help of ultrasound and a guided injection can help to relieve the pain. Pulsed radiofrequency treatment is sometimes utilised to prolong the effects.